Learn more about Ho‘oulu Hawai‘i: The King Kalākaua Era with the accompanying audio tour available on the HoMA app. Written and delivered in English by our curator of the Arts of Hawaiʻi, Oceania, Africa, and the Americas, Healoha Johnston, the tour was also translated and recorded in ‘Ōlelo Hawai’i by Paige Okamura—aka DJ Mermaid. This is HoMA’s first time offering an exhibition tour in ‘Ōlelo Hawai’i, and with all the exhibition labels, wall text, and printed program also available in both languages, we are proud to describe Ho’oulu Hawai’i as our first completely bilingual exhibition in Hawai’i’s native language. 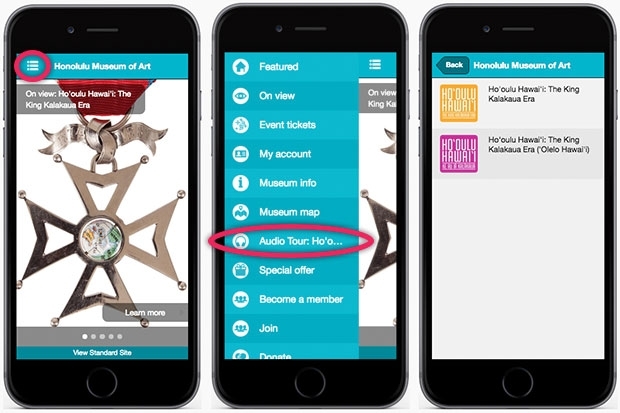 Once you’re in the audio tour section of the app, select the yellow icon for English or the pink one for ‘Ōlelo Hawai’i, then press the play icon for the corresponding piece. As you walk into the exhibition space, the order of artworks with corresponding tracks is arranged clockwise from the gallery entrance—look for the headphones icon on the title cards of each piece. Both versions of the tour are also available as playlists on HoMA’s Soundcloud. Ho‘oulu Hawai‘i: The King Kalākaua Era is on view through January 27, 2019.